As part of his first production at Lawrence University last spring, Copeland Woodruff, the college’s new director of opera studies, surveyed his audience, asking them to share instances of feeling unwelcomed or as an outsider. He was so moved by the outpouring of responses he received, he knew he had to do something to further address some of the experiences that were shared. That “something” became the collaborative project “Expressions of Acceptance” that will feature more than 40 Lawrence student singers, including 30 from the Improvisational Group of Lawrence University (IGLU), and instrumentalists simultaneously performing 13 “micro-operas” — each about 5-8 minutes in length — in the lobby of the Fox Cities Performing Arts Center in downtown Appleton. 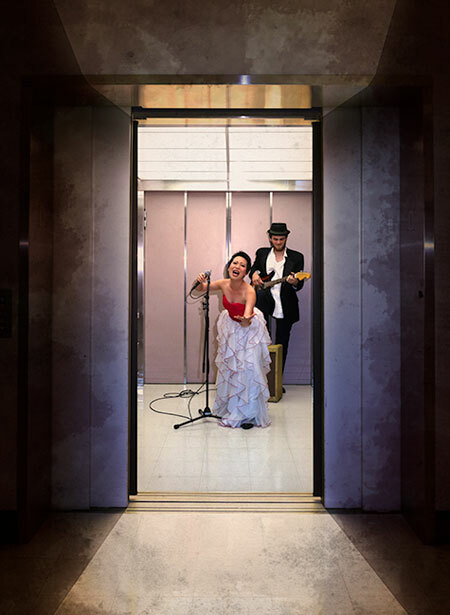 Every nook and cranny of the four-story lobby will be utilized for performances, including stairwells, seating areas, the bars and even the elevator. The performance, Monday, Nov. 2 at 7:30 p.m., will be preceded by a walk through downtown Appleton by organizers and community partners starting at 7 p.m. in front of the Lawrence Memorial Chapel and ending at the PAC. Anyone is welcome to participate in the walk, which is designed to embrace community and celebrate Appleton. Following the performances, the audience will meet the cast and creative team and spend time together digesting the experience with community leaders in the Kimberly-Clark theatre. A collaboration between Lawrence’s student organization GLOW and Celebrate Diversity Fox Cities (CDFC), Riverview Gardens and COTS, the campus and local organizations hosted pre-show and post-show events. Each audience member was asked to complete a four-question survey that asked them to describe a time in their life when they felt like an outsider, why it’s common for people to be wary of strangers or newcomers, what can be done to help people feel welcome and accepted and what obstacles do newcomers to Lawrence or the Fox Cities face that might prevent them from enjoying all that the community can offer. The Community Foundation for the Fox Valley Region is a co-sponsor of the “Expressions of Acceptance” project, supporting it with a $2,500 grant. In addition to the partners who worked with Woodruff on “The Tender Land,” additional community collaborators assisting with the “Expressions of Acceptance” production are Kathy Flores, the diversity and inclusion coordinator for the city of Appleton, African Heritage, Inc., INCLUDE, Casa Hispana, E.S.T.H.E.R., Goodwill, and CODA.